While living the expatriate life in Ghana, West Africa, I once accompanied my husband on a short business trip to Harare, Zimbabwe. (The bad times were brewing, but had not yet fully developed.) Having done my research, I was eager for the culinary adventure of eating mopane worms, which are considered a delicacy all over southern Africa. The photo here shows you some beautiful specimens, and yes, they’re actually caterpillars, not worms. The credit for the photo goes to skabear. You can find more of his pictures here. I had planned to eat worms tonight, but instead I’m facing a hamburger and fries. I am not amused. Having traveled thousands of miles across the African continent I have arrived in a country with the exotic and lyrical name of Zimbabwe, land of the fabled Shona chiefs. And now see me sit here in a restaurant called the Silver Spur, decorated with images of an American Indian chief in full feather regalia – on the wall, on the menus and on the place mats. Faux Tiffany stained glass lampshades dangle from the ceiling. Our waiter is a handsome black kid wearing jeans and a black T-shirt sporting, yes, an Indian chief. “My name is Steve and I am your waiter tonight,” he told us cheerily. The menu offers no worms, but there are steaks and hamburgers and ‘surf and turf’ and a Tex-Mex dish and more familiar foods. And let me not forget the salad bar. I’m here with three men: GD (my spouse) and two other American consultants with whom he’ll be working on a project proposal. One has flown down from Washington, the other up from Johannesburg. We discussed dinner plans earlier, but the men were not interested in worms. They wanted steak, red-blooded Americans that they are. I pointed out that mopane worms have three times as much protein as beef. They gave me a look. You can imagine what kind. We eat and drink beer. The men talk about the project that has brought them to Harare, and about economics and politics. I think of worms while chewing my hamburger. 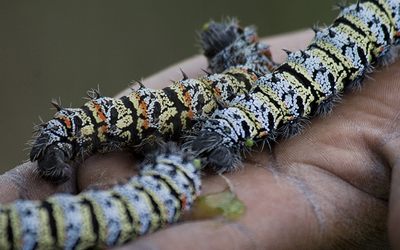 Mopane worms, also called madora or macimbi are not worms at all, but caterpillars that make their home in the mopane trees. Sun-dried and stewed, they’re considered a delicacy and who am I to disagree if I have not tried them? Even just one? Just so I can gross out my family and friends with my tale of gastronomic daring. But it is not to be tonight. Here I am in exotic Zimbabwe, at the Silver Spur, eating a hamburger served by Steve. It’s enough to make me want to cry. GD, being a good guy, squeezes my hand and promises me that tomorrow we will try and find worms. From our hotel room the next day, famous guidebook in hand, I make my phone calls. The book says mopane worms are served in the Komba Hari restaurant in – I kid you not – the Sheraton Hotel. I call the number, but nobody answers. I double check the numbers in the phone book to see if I have the correct ones. I do. I call several times and nobody answers. We’ll just go there and see. After GD arrives back from a day of meetings, we get in a taxi and head for the Sheraton, which offers several restaurants, one of them a Japanese eatery. Through the glass windows we see the customers seated around the U-shaped tables and the cook standing in the middle doing his fast and fancy cooking show on the grill in front of the hungry eaters. We’ve come to the end of the hall to another restaurant, which we take to be the one we are looking for. An elegant Zimbabwean hostess at the entrance smiles at us and invites us in. It looks very ritzy. Everything gleams and glitters and wonderful aromas permeate the air. “Do you serve worms?” I ask. She frowns. “We have a buffet,” she says, gesturing at the tables laden with food. “African food?” I ask hopefully and she looks puzzled now. I tell her that the famous guidebook says that the Komba Hari serves local delicacies such as pumpkin leaves, sadza, kapenta, and mopane worms. She points at the Japanese restaurant next door. “That is the Komba Hari,” she informs us. “That is Japanese,” my man states. GD and I look at each other. So much for the famous guidebook. We thank the elegant Zimbabwean lady and get out of there. There are no worms at the Sheraton. The Ramambo is our back-up restaurant, this one from the Lonely Planet. It offers wild game dishes featuring eland, crocodile, ostrich, warthog and more. So we do have a very exciting dinner, but still no mopane worms. The next day, our last in Zimbabwe, I am cruising through the Harare suburbs in a taxi, having a look how middle class Zimbabweans live. They do fine. Nice houses, clean, wide streets. Like suburban America with walls and gates added. On one of the streets I see several cardboard boxes stacked up in the shade of a big tree. WORMS FOR SALE reads a big handwritten sign. I turn to the taxi driver and point at the boxes. “Are these for eating?” I ask. Clearly, I’m not going to have my worms this time around. NOTE: In case you’re interested, here’s a recipe for succulent mopane worms.